State Senator Martin Sandoval (D-11), who has close ties to San Antonio Mayor Julian Castro, a rising Latino leader in America, joined the mayor to celebrate the Hispanic business community in St. Louis. 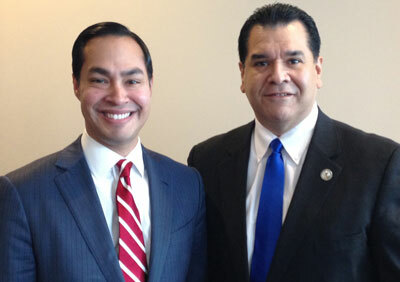 “The great change and growth that Mayor Castro has achieved in San Antonio is very inspiring,” said Sandoval. “This growth, as well as the engagement of the Hispanic community, is something that we are currently striving to achieve in the Midwest region. The 39-year-old San Antonio native Mayor Julián Castro is the youngest mayor of a Top 50 American city. First elected on May 9, 2009, Mayor Castro handily won re-election in 2011 with nearly 82 percent of the vote, making him the fifth Hispanic mayor of that city. He became a household name after being selected by President Barack Obama to deliver the Keynote Address at the 2012 Democratic National Convention in Charlotte, North Carolina. Many consider him as having the potential to become the first Hispanic president of the United States. 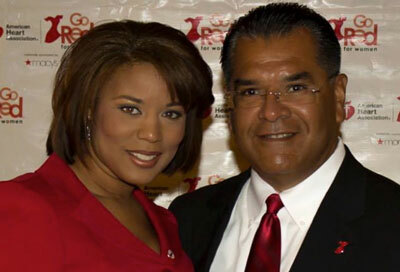 State Senator Martin Sandoval (D-11) joined Maggie Poteau, News Anchor for WICS TV Channel 20 in Springfield, by ‘Going Red' for Women and Heart Disease at the State Capitol. Sandoval, Jackson Honor Dr. Martin Luther King Jr.